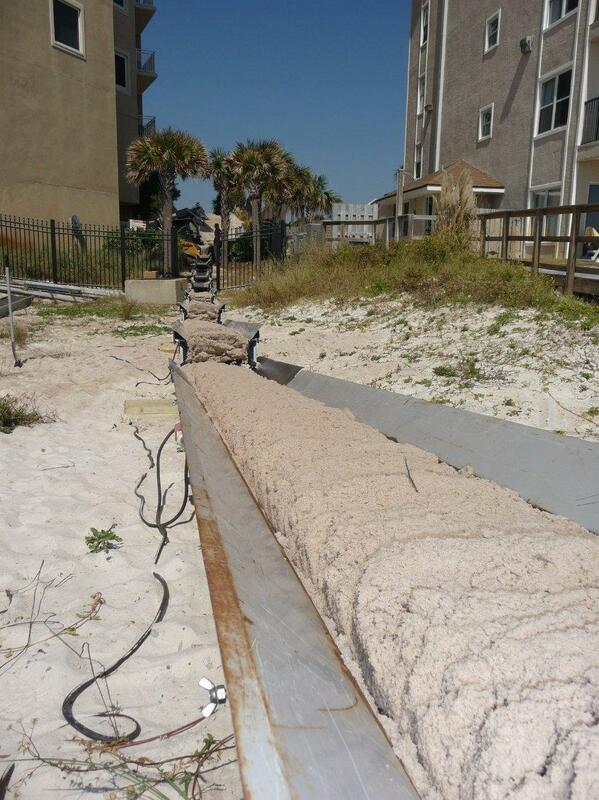 Access Construction Equipment manufactures MiniveyorUSA and Miniconveyor Powerful Portable dirt & sand conveyors. 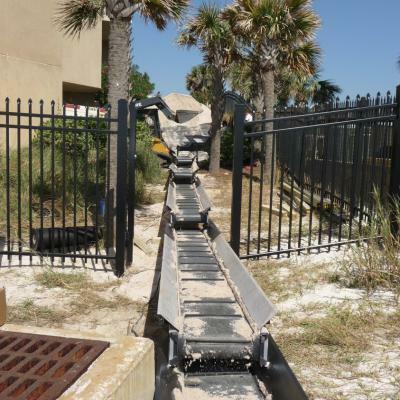 Because of their size and convenience, these dirt & sand conveyors can easily be laid out between buildings and through existing gateways. They are fast and easy to set up, and safe to use. 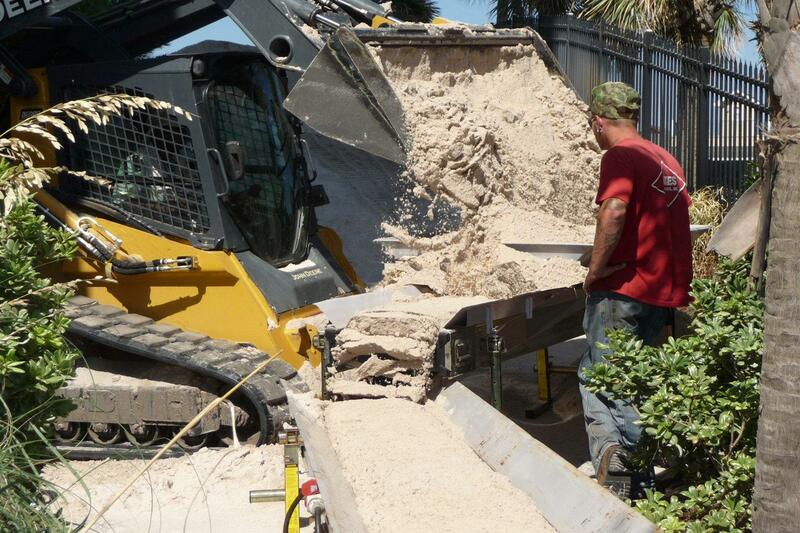 Using a wheelbarrow to move sand, dirt or gravel is a backbreaking task. 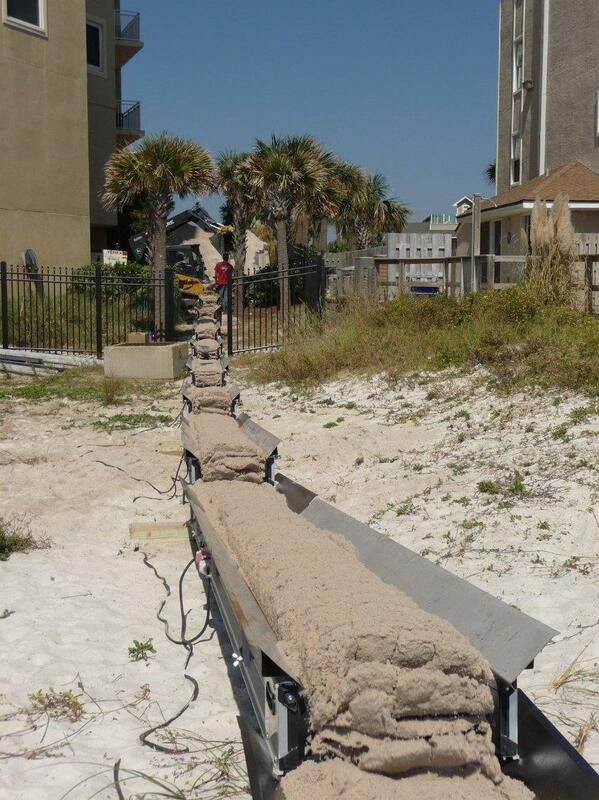 Our portable conveyors move dirt, sand, and gravel as much as 5 times faster than a wheelbarrow, saving time and money. 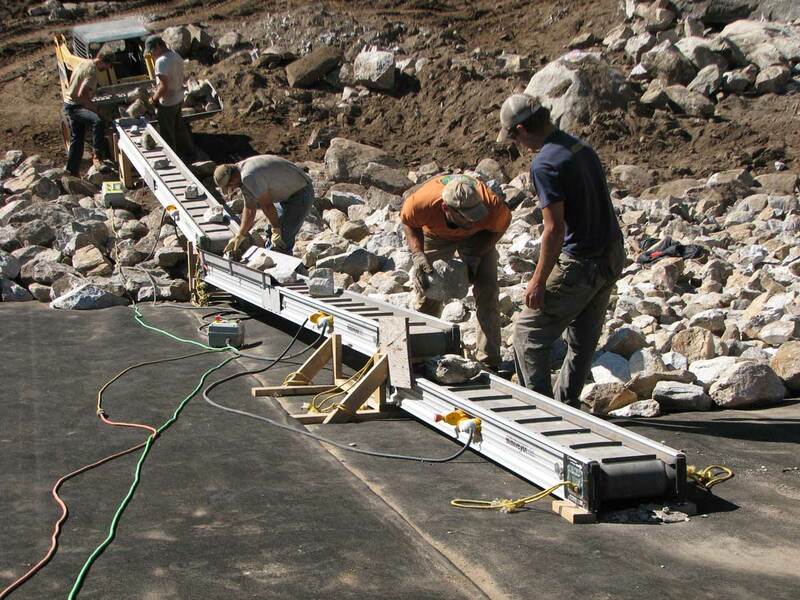 Made for rugged applications, Miniveyor portable conveyors can handle most jobs. 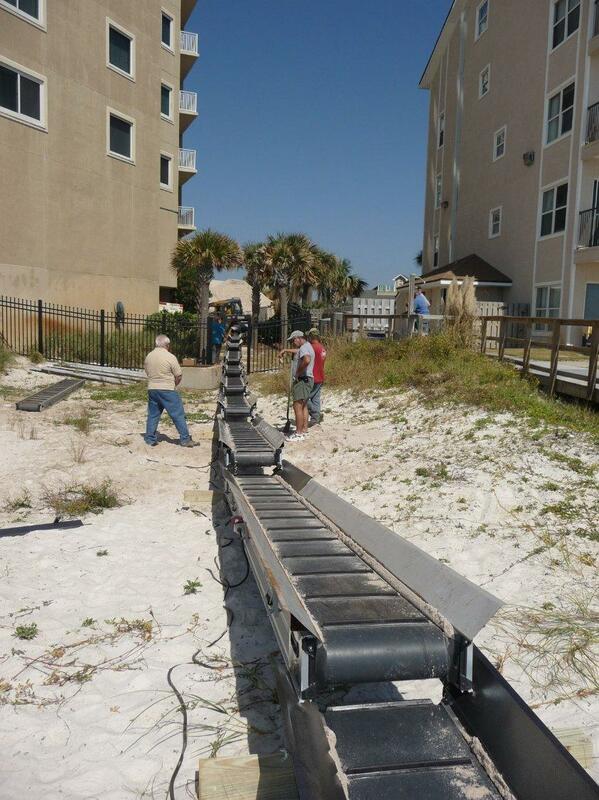 Miniconveyor and MiniveyorUSA portable mini conveyor belt systems are constructed of aircraft grade anodized aluminum sides, stainless steel slider beds on top and bottom, high frequency microwaved PVC belting, hermetically sealed motors, and a high-density foam core. The combination of strength and versatility makes this belt mini conveyor system unique in the market. 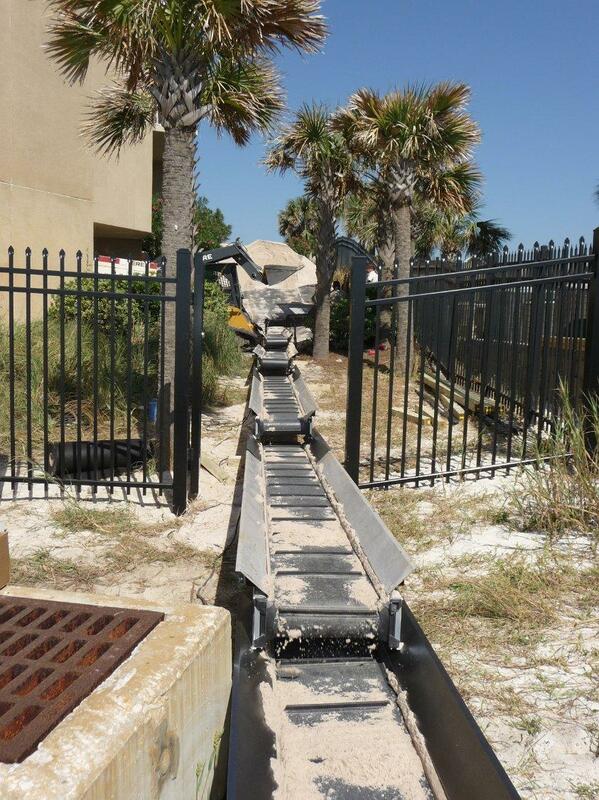 Our portable sand, dirt, and gravel moving conveyors come in 5’, 10’, 15’ and 20’ sections to fit the needs of all your jobs. 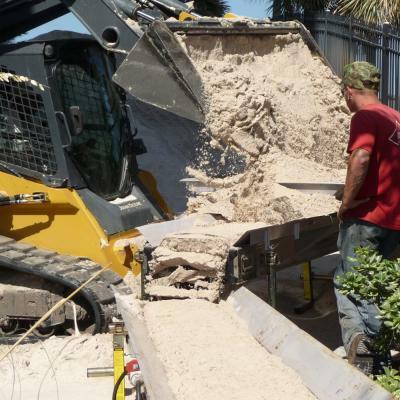 Our 15” wide portable sand, dirt, and gravel conveyor version handles 25-30 tons per hour and the 20” version handles 45-50 tons per hour. 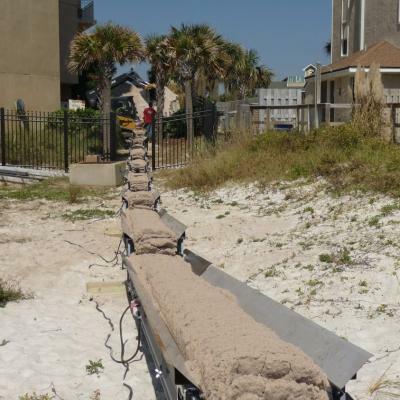 We manufacture the portable sand, dirt, and gravel conveyors in different voltage options, including 120 Volt, 220/240 Volt or 480 Volt 3 Phase motors. 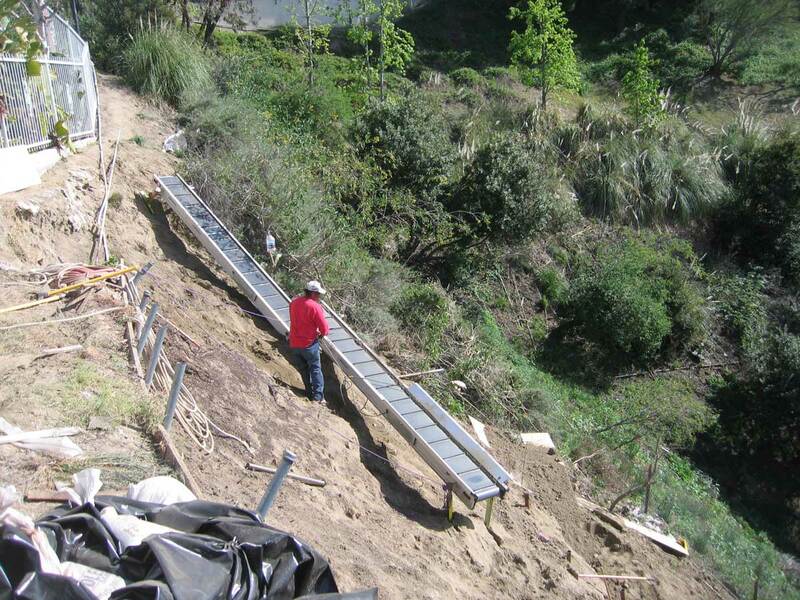 Whether you are moving sand, dirt or gravel up a steep bank or into a dump truck, moving material across level ground, down a slope, or below grade excavating, the Miniconveyor and MiniveyorUSA portable conveyor systems offer the unique solution for difficult jobs. Florida’s coast is ever changing. 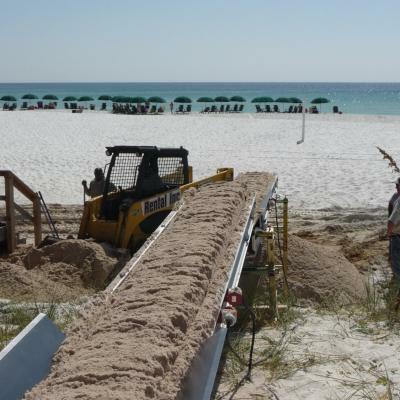 Contractors need to think outside of the box when tides, winds and rain shift white powder sand around to the point that repairs must be made. 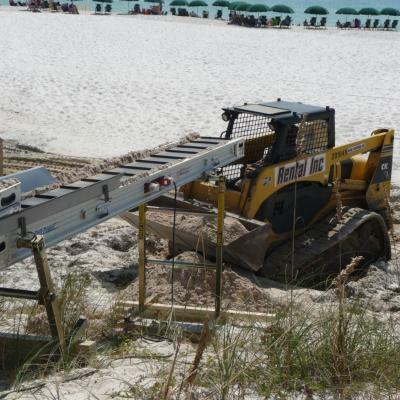 That is where Access Construction Equipment’s portable sand conveyor, MiniveyorUSA, came in for this private section of Florida beach. The erosion of the sand had left large low areas, allowing huge areas of stagnant water to stand all along the coastline. In addition to these stagnant pools being unsightly, they can also be dangerous. 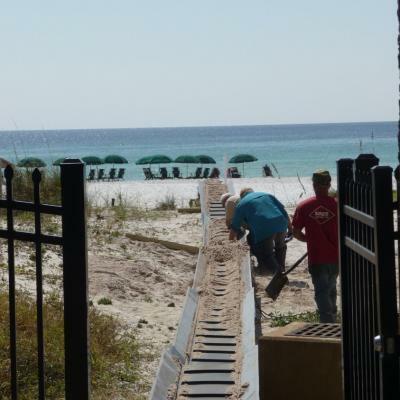 The condominium association along this stretch of beach sought to repair the beach in order to restore the usability, beauty and values of their property. 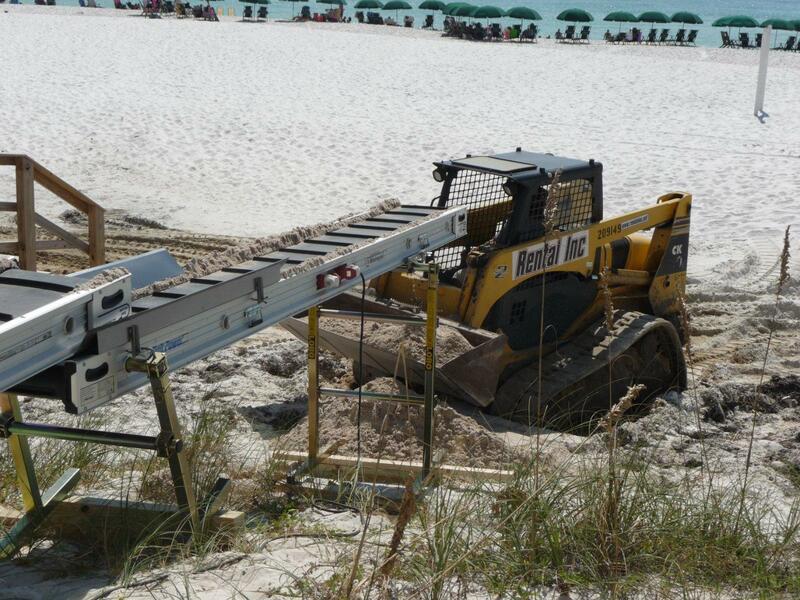 Their contractor turned to Access Construction Equipment for a unique answer. 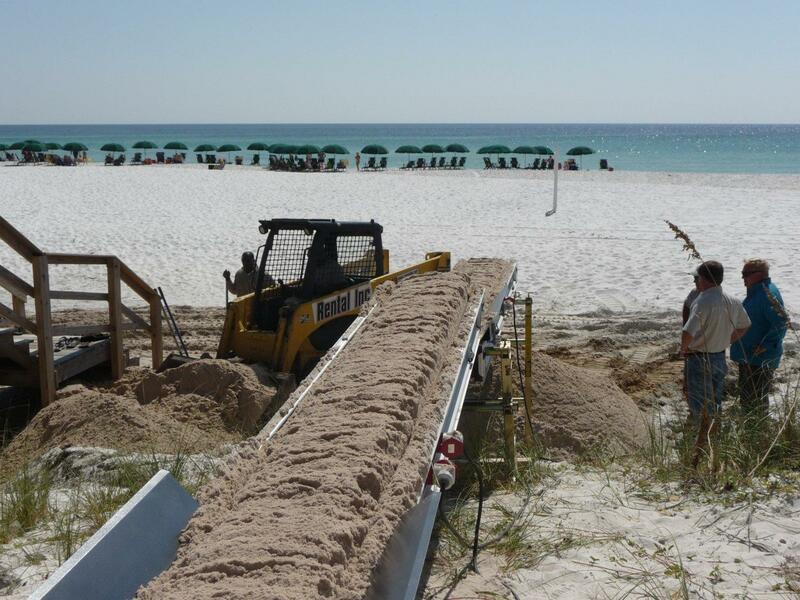 The contractor had many limitations in devising a plan to bring in 1500 tons of sand to the beachfront. 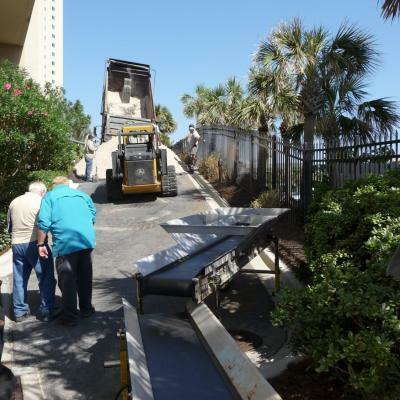 The condo association rules would not allow for equipment such as bulldozers to run back and forth onto the beach because of the destruction they would cause. 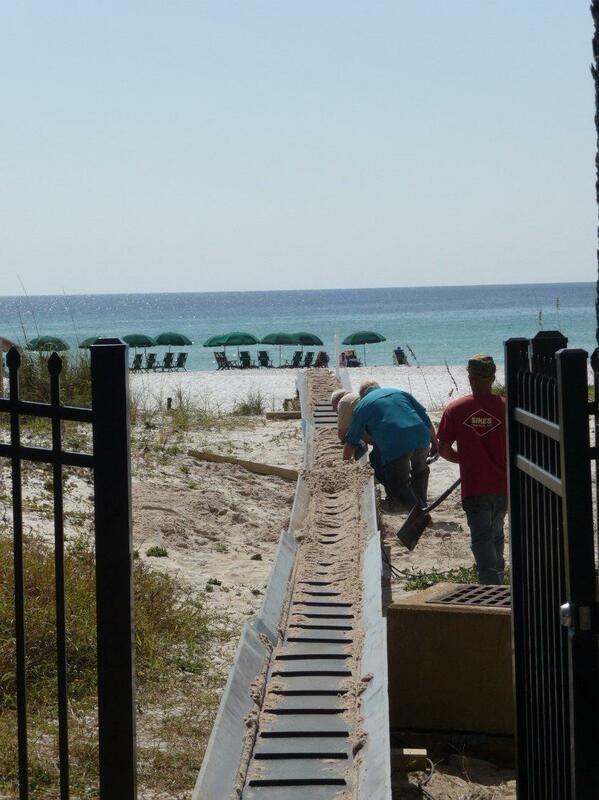 Beach access was also an issue due to vegetation, fencing and the uneven soft sand. 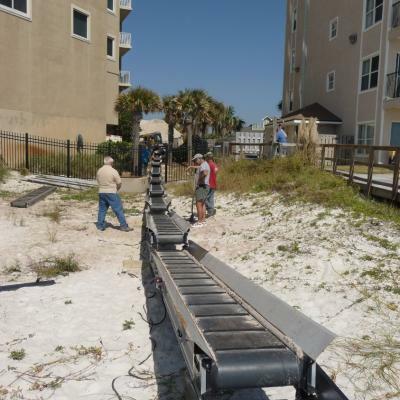 The only conventional choices seem to be to lay down boards and run wheelbarrows back and forth from the roadway to the shoreline. Or a bucket brigade of workers passing containers of sand over that long distance. Either option would be slow, time consuming, strenuous and would require a lot of manpower and time at a huge cost. 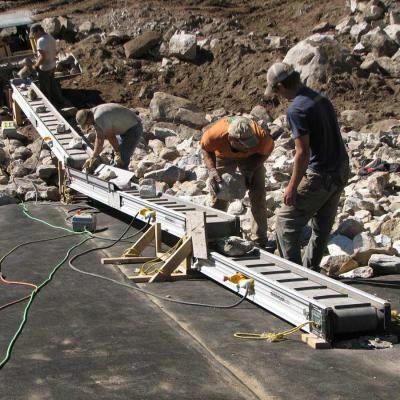 Access Construction Equipment had a much more efficient, cost effective solution. 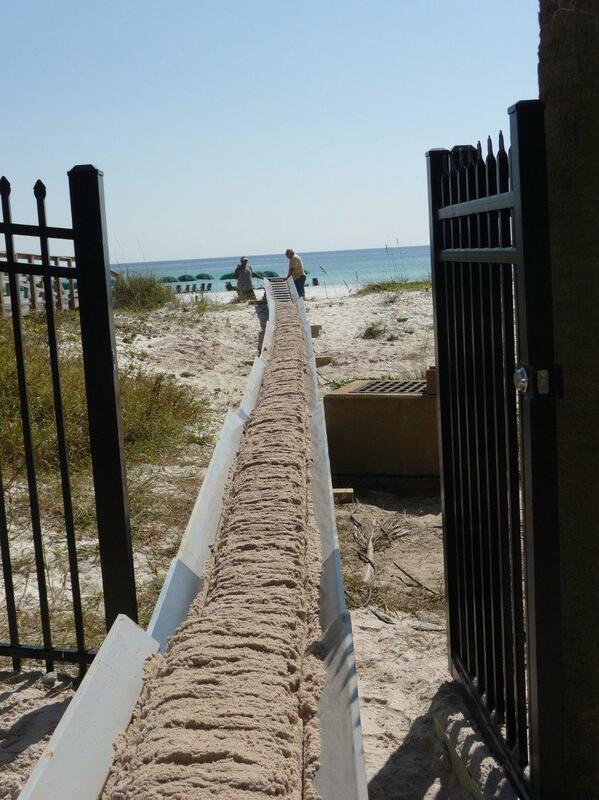 Access manufactures MiniveyorUSA and Miniconveyor Powerful Portable dirt & sand conveyors. 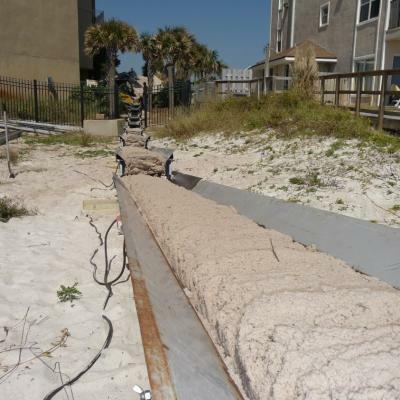 Eleven 20” wide dirt & sand conveyors were brought in and set up, stretching over 150 feet from the parking area to the edge of the sand line. 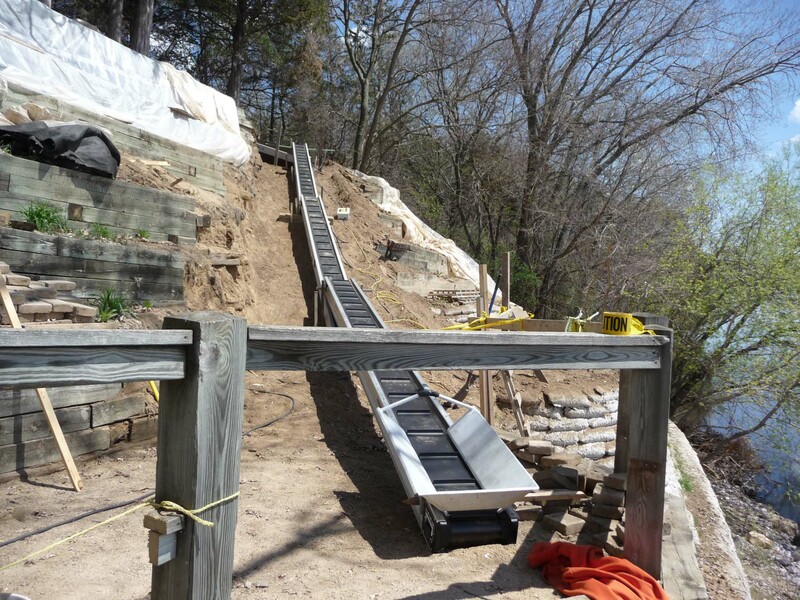 MiniveyorUSA belt conveyor system was perfect for the job. 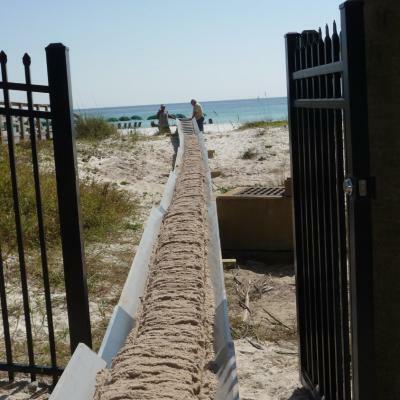 Because of their size, the dirt & sand conveyors could be easily laid out between buildings, through existing gateways and leave its path completely undisturbed. 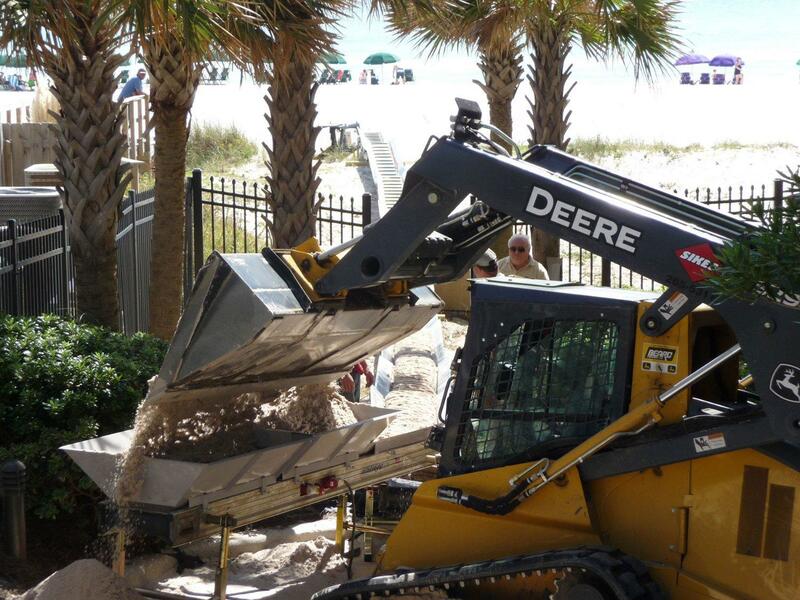 1500 tons of sand were brought in by dump truck and loaded onto the first conveyor using a 6’ skid steer bucket. 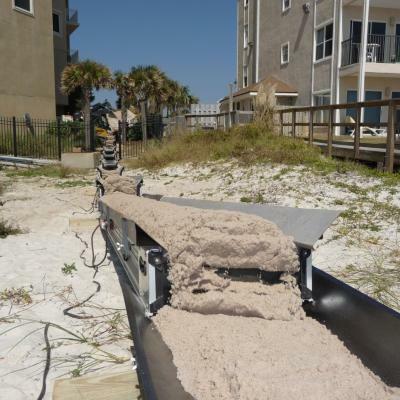 The conveyors carried the sand continuously across the terrain and onto the beach where it was deposited and moved into place by a small bobcat. 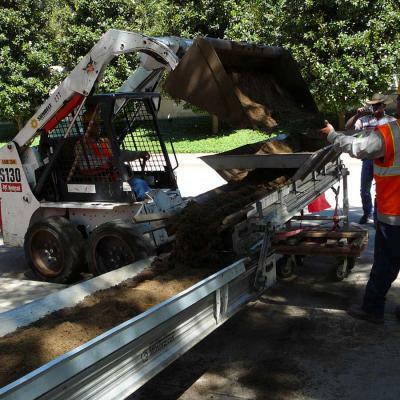 The benefits of using MiniveyorUSA for this job were many. Estimated time for completion of this job using wheelbarrows or buckets was a minimum of 3 weeks. 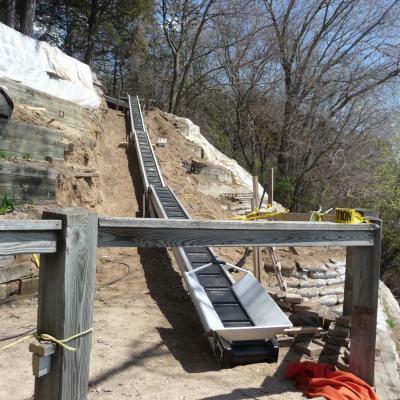 The entire job, using MiniveyorUSA portable sand conveyor system, took one fifth that time and was completed in an incredible 4 ½ days. 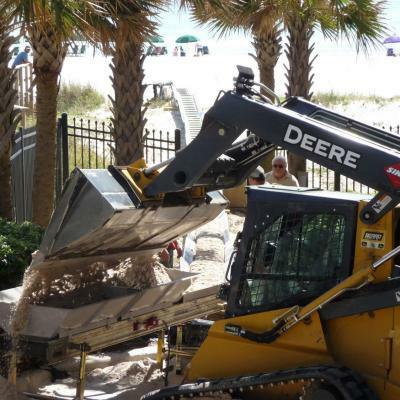 The time factor certainly pleased residents of the condominium complex and beach goers. Manpower was another huge saving factor. The number of workers needed for the backbreaking task to push wheelbarrows or carry buckets for 3 weeks was cut to only a few workers for a much shorter period of time. With MiniveyorUSA workers were needed only at the load end and the discharge end of the conveyor run, totaling 3 people. This was much less disruptive for residents and vacationers alike. When the job was complete, in less than a week, the conveyors were picked up and taken away, leaving absolutely no footprint behind. Vegetation and wildlife were undisturbed and no fences needed repair since the conveyors fit right through the open gate. MiniveyorUSA is completely environmentally friendly. The condominium residents were thrilled with the end result and the means to get there using Access Construction Equipment’s MiniveyorUSA. The effects of nature on our environment are numerous. 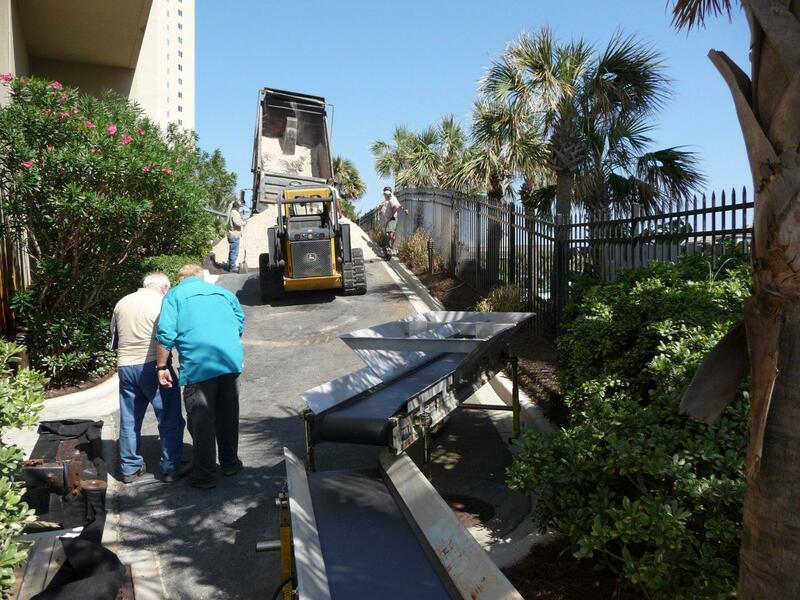 Access Construction Equipment’s Portable Conveyors have been used again and again to efficiently move materials. 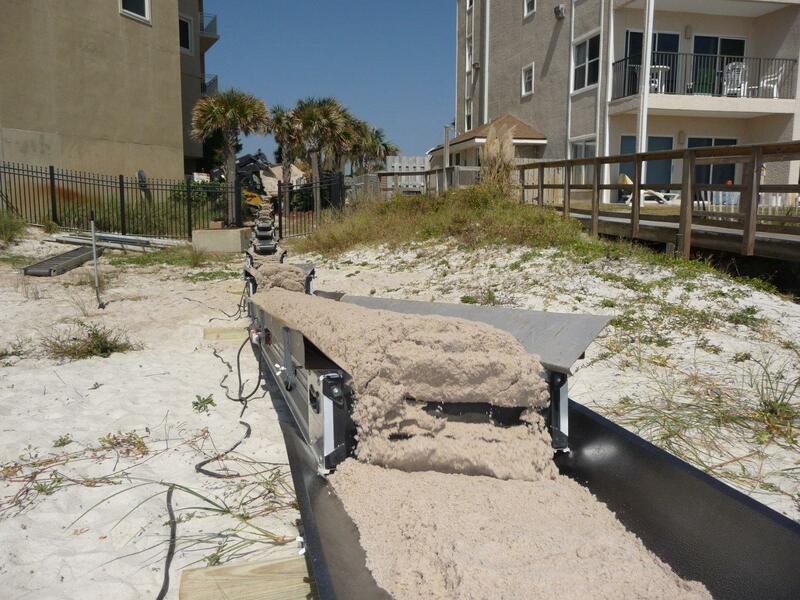 After Hurricane Sandy devastated the Atlantic states in 2012, these conveyors were used frequently to remove sand and debris in the cleanup effort. 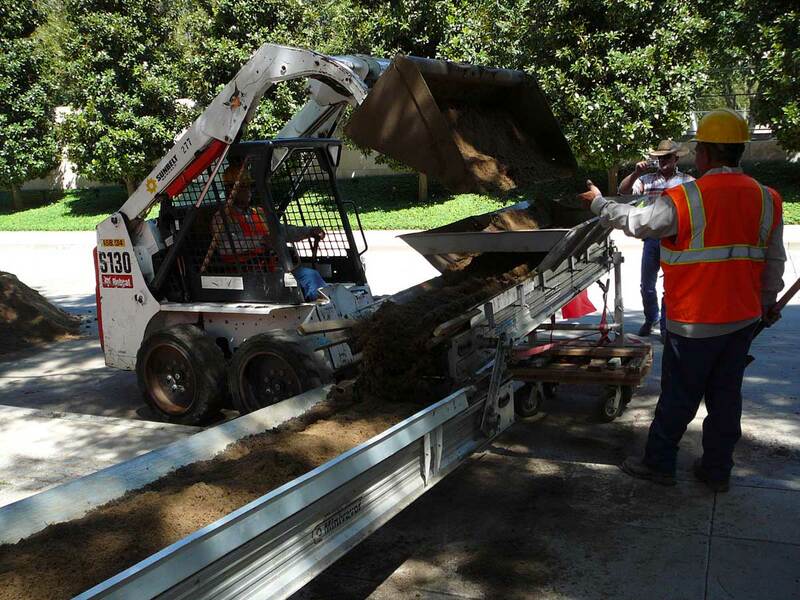 Likewise, MiniveyorUSA have been used in California to replace dirt that moved downhill on the steep slopes that surround many homes there. 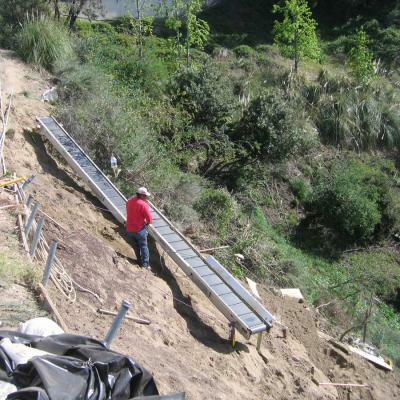 Erosion, whether it is slow over time or the result of one violent natural disaster, can be repaired more quickly and more easily with the help of MiniveyorUSA.